I should love "Laurence Anyways." It's a trans movie in a film-business landscape seemingly unaware of our kind, an epic-length chronicle of romance that questions gender and sexual fluidity, and everyone else likes it. So why can't I get on board with it? It all really boils down to an eternal question: Should a film depicting a member of an oppressed, in this case mostly invisible, minority group be required to explore their outlook, or should art be able to exist on its own terms? Does a film need to eat up a significant portion of its runtime giving exposure to its real world issue many are unaware of, or can it use that issue for its own narrative and thematic goals without bothering with that? It's somewhat unfair to critique a film for not being what it isn't, but shouldn't the artist offer insight into the issue his art is purporting to illuminate? This is the sticking point for me, because, unlike something like "The Crying Game", Dolan's film does seem to be setting the transgender issue up as a core conflict from the start. This being the case, the seeming lack of desire (or maybe ability) to actually probe his trans character's mindset, combined with his gaudy, film-school-reeking aesthetic, leads me to suspect the worst possible conclusion: that Dolan didn't actually care about visibility for trans people, he only cared about visibility for himself as someone who made a trans film and possesses a distinct authorial stamp. The film takes place over the course of ten years. Never does Laurence (Melvil Poupaud) change her voice. Nor is there any mention of hormone replacement therapy, or anything of the sort. This all seems to back up the notion of this being a perfunctory treatment of the subject matter, and ultimately a self-aggrandizing film. Most of the beats in the first half, in which Laurence's transition is chronicled, are completely expected. Some conservative group doesn't understand, so she gets fired. Some too-chatty waitress doesn't understand and gets excoriated by Fred (Laurence's partner, played impressively by Suzanne Clément). Even the celebrated sequences of people staring at Laurence as she walks down the street, or through her workplace's hallways, feel like a required element. These just aren't creative scenarios, and the fact that they all come in this same film lead them to ring even more false. It's as if Dolan is pandering to trans people by reflecting a batch of circumstances he assumes are most likely for them to have experienced, but by merely going through the motions of doing so, he's somehow making rare subject matter come off as clichéd. But maybe I'm not giving Dolan enough credit here. He himself is gay, so maybe it's unfair to peg him as a mere spotlight-stealing ally. Maybe he truly tried with all his heart but failed to convince. The most obvious issue with the film that I'm far from the first to point out is that it's about twice as long as it needs to be. This is of course a fairly simplistic criticism, but the more pressing fallout from this is that it ends up burying our two leads' personal conflicts under an avalanche of white noise. What instead dominates the film is Dolan peacocking his visual technique in an attempt to be recognized as a serious auteur, and many are buying it, declaring him a prodigy. Let's compare the visual style of this film to the more pared down effort from Kimberly Peirce, "Boys Don't Cry". While "Laurence Anyways'" flamboyance can at points register some potency, for the most part it feels overdone and cocksure. "Boys Don't Cry," while it suffers from some degree of artificiality in its writing, manages to actually come off as authentic. Peirce has a knack for moving the camera with whatever energy the scene requires, whether it's gliding with a sparkling, placid sexuality in the film's most "controversial" scene or hovering as if ready to strike in the latter scene where Brandon (Hilary Swank) is exposed. The core difference here is "Boys Don't Cry" is a tribute first and foremost to its protagonist, whereas the protagonist is arguably the least interesting part of "Laurence Anyways". Peirce's film understands. This one, I'm not so sure. Another key factor to note in these examples is the actors portraying characters nonconforming to their own gender identity. 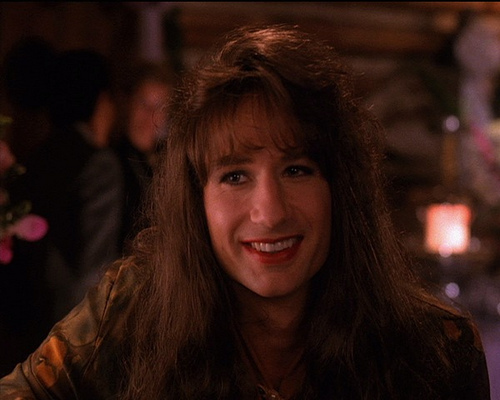 I'll throw in David Duchovny's Denise from "Twin Peaks" as well, simply to have another male-to-female reference point. Melvil Poupaud delivers a studied, sensitive performance as Laurence that doesn't feel as showy as it could have. It's a worthy depiction of a trans person to add to the gaunt ranks of our media representation. While Poupaud is effective in approximating feminine mannerisms with minimal problematic "caricaturization", Swank blows him out of the water. Her performance captures a kind of inherent tension that is gender dysphoria. She's exactly the right kind of nervous at all times, walking a tightrope between Brandon Teena's interior and exterior fear. It's just a far more helpful, caring reflection of the mindset than Poupaud's proficient drag show. Duchovny's portrayal of Denise is, by the very nature of the series she's a part of, a more stilted, dry performance than the others. Duchovny imbues her with a slinky femininity you'd expect to see in a classic noir, and he rarely overdoes it. The distinction between Duchovny's performance and the other two is that it seems effortless. The writing is just as subtle. Denise's status as trans is incidental to at least half of her dialogue, and whenever a joke about her gender does come up, it's always lightweight and with its heart in the right place. This is the ideal portrayal of a trans* character to me. It's queerness made banal, and it is what we need more of. And while cis people portraying trans people will always be at least slightly problematic, with a nuanced approach we can separate the helpful portrayals from the regressive.